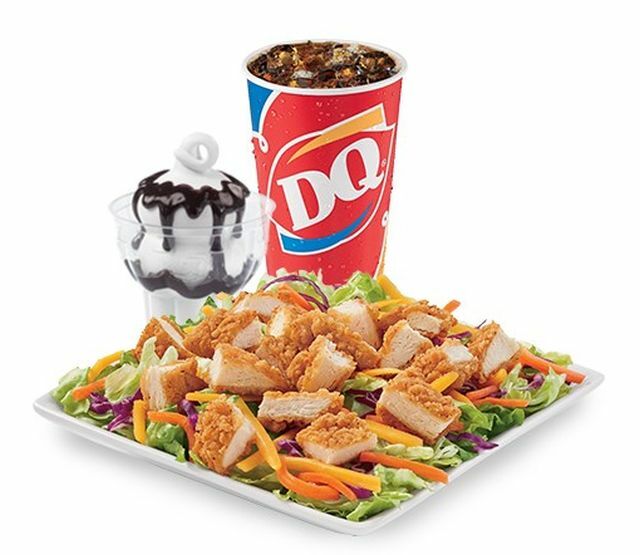 Dairy Queen adds two new entree choices for their long-running $5 Buck Lunch Menu. Along with the regular selection, you can now also choose from the KC BBQ Bacon Cheeseburger as well as the Crispy Chicken Salad. The KC BBQ Bacon Cheeseburger consists of a beef patty, American cheese, applewood-smoked bacon, pickles, onions, and Kansas-style barbecue sauce on a toasted bun. The Crispy Chicken Salad doesn't have to be crispy at all as you can get it with a choice of either cut-up breaded or grilled chicken strips. It also includes shredded carrots, red cabbage, and shredded cheddar cheese over a bed of lettuce plus a choice of Marzetti dressing. The KFC BBQ Bacon Cheeseburger $5 Buck Lunch comes with fries, a 21-oz drink, and a small sundae, while the salad just comes with the drink and sundae. The chain's $5 Buck Lunch menu is available at participating locations, specifically excluding those in Texas. In other news, Dairy Queen is featuring the Snickerdoodle Cookie Dough Blizzard as the Blizzard of the Month for October 2018. It was introduced last month as part of this year's fall menu and consists of soft snickerdoodle cookie dough chunks and cinnamon-sugar blended with vanilla soft serve.